Khadka's demise an irreparable loss to nation, Deuba says - Integration Through Media ....! DANG: Nepali Congress President Sher Bahadur Deuba has said that demise of NC leader Khum Bahadur Khadka was an irreparable loss to the nation. At a condolence meet on 13th day of Khadka’s passing away here on Wednesday, the NC president said that the country lost a democratic fighter while the NC lost an efficient organizer.”Khadka’s demise has not only caused loss to the NC but also to the nation. 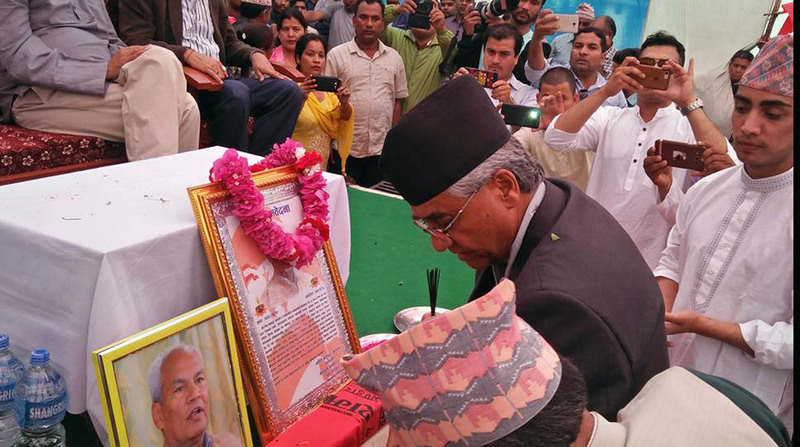 He was an experienced, fearless and development-friendly leader,” Deuba said. During the programme, NC leader Dr Shashanka Koirala, Shekhar Koirala, Dr Prakash Sharan Mahat, Dipak Giri, Parbati DC Chaudhari, Kishor Rathor, Kirti Bahadur Khadka, UML leader Tikaram Khadka, Maoist leader Nirmal Acharya and others were present.